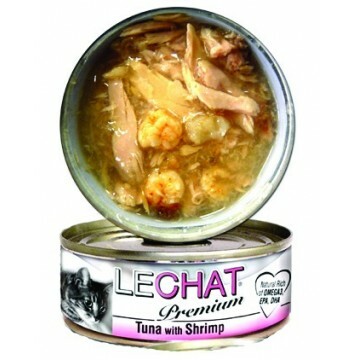 LeChat Premium canned cat food consists of delicious chunks of tuna meat and toppings like chicken, kanikama (crabmeat), salmon and shirasu (whitebait) in jelly. They are steam-cooked, resulting in a soft texture and enticing aroma. LeChat canned cat food is gluten-free and made without preservatives and colouring. Naturally rich in Omega 3, EPA & DHA, LeChat Premium wet cat food is a complementary cat food that should be fed with a complete & balanced cat food. 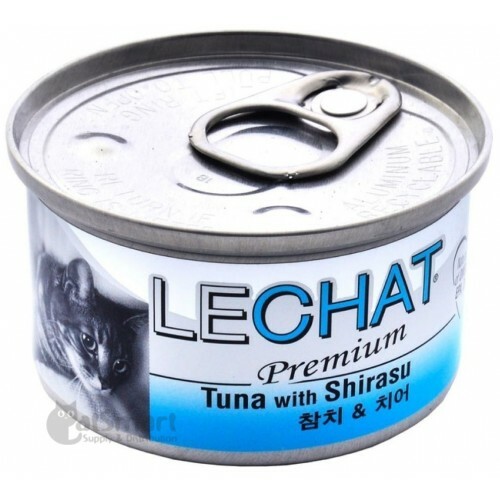 Tuna, Shirasu, Gelling agent, Vitamin E.
Moisture - 82.0%, Crude Protein - 12.0%, Crude Fat - 0.5%, Crude Fibre - 1.0%, Crude Ash - 2.0%, Ca - 0.06%, P - 0.5%. 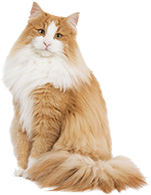 Feed with other complete and balanced cat food (dry or wet).